For most of my trips, I book hotels in advance. This has a number of advantages: better rates, better point strategies, no stress to find suitable accommodation, etc… My latest trip to Thailand (May 17-27) was an exception, with only the first three nights booked in advance at Hilton Millennium Bangkok and Sofitel So Bangkok. On my third day in the Thai capital, I decided to add an extra night and pulled-up Hotelscombined.com on my mobile. 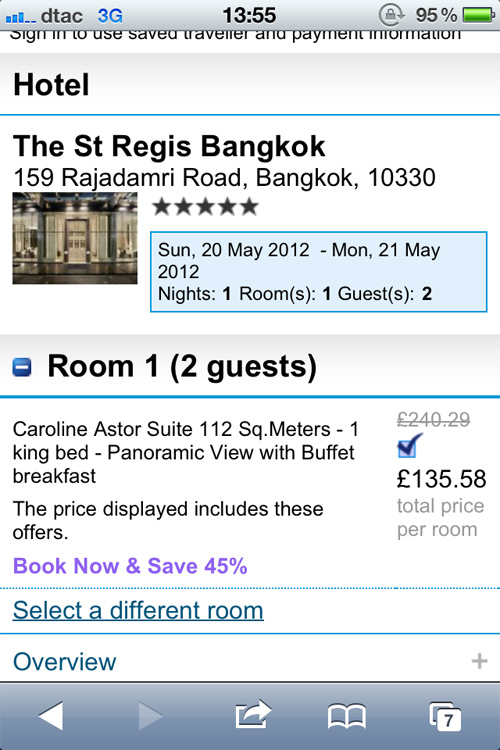 To my surprise, ebookers.com was selling St. Regis Bangkok Caroline Astor Suites at a cheaper rate than regular Deluxe rooms. As the cheapest rate for this suite is normally at least €200 more, I didn’t hesitate and booked it for £137.56 (€176,50 on Amex) including breakfast. Upon arrival at St. Regis Bangkok, assistant manager Ms. Papatsorn performed our check-in. “Mr. Lapers, we can’t seem to locate your reservation in our systems…” Here comes trouble, I thought to myself. I pulled out my laptop and showed the ebookers.com confirmation email to Ms. Papatsorn. “Mr Lapers, THB6500 for a Caroline Astor Suite? We normally charge THB25000 for that suite! Would you mind we verify your reservation with ebookers.com? We can offer you a drink at the Drawing Room. Is that alright?” At that point, I started to doubt whether they were going to honor my rate. But after 20 minutes or so, the comforting words “Your Suite is ready Sir” were spoken. Caroline Astor Suite 2025 was impressive, with a spacious living room and bathroom facing the Royal Bangkok Sports Club and the bedroom facing the St. Regis swimming pool. Being so pleased with the suite, I immediately checked if the same rate was still available for the weekend after. It was, and so I booked the Caroline Astor Suite again via ebookers.com for a second stay on May 25-26. Not realizing yet, Lady Gaga would also be a guest at St. Regis Bangkok that night! Two days before my second stay, I emailed the hotel to assign me a Caroline Astor suite with bedroom facing the Royal Bangkok Sports Club. A request which was honored (my second stay was at suite 1924) and which I can highly recommend as those suites have an even more spectacular layout and view from the bedroom. I checked the rate for 22-23sep which was 750 euro for the Astor suite. How do you get to the 176 euro? Was this a mistake on ebookers? @Duy Yes, it must have been an error rate as the suites were selling cheaper than the Deluxe rooms on Ebookers. I was just lucky, I guess. If you’re interested in booking hotel error rates, I suggest you keep an eye on http://www.flyertalk.com/forum/hotel-deals-607/ Good luck! Caroline Astor Suite in St Regis Bangkok. Sooooo jealous of you to stay there for 2 nights with that bargained price. I can’t even afford one night.